The beauty and soothing sounds of unusual outdoor wind chimes are also powerful tools of feng shui. Wind chimes attract and emphasize positive chi, counteract and disperse negative energy, and restore balance and harmony. One of the most popular and effective feng shui cures is sound, and wind chimes are the most commonly used tools for this type of cure. With their pleasant sounds and pleasing designs, wind chimes are displayed both inside and outside of homes. You can create a tranquil yard with any of these unusual outdoor wind chimes. In feng shui, wind chimes attract auspicious chi energy, so be sure you select one that also has a calming effect. Unique Feng Shui offers a decorative 25" L x 13" W wind chime has an antique finish. It can be used as a feng shui solution for nosy neighbors. The metal cones shaped bells are suspended from an antique metal rod that resembles a slender twig. Every other space features a metal embossed rooster shaped cutout. The wind chime is advertised as a great deflector of neighbor gossip when suspended so it faces a gossiping neighbor's home. Wind & Weather offers an artistic colored porcelain koi fish wind chime available in blue, green or red. This feng shui symbol can be used to attract auspicious chi energy. The 15"L x 4¾"W chime has a distressed finish and is weather-resistant. This 15"L turtle wind chime provides support and should be hung in the backyard area of the house. Hand-carved and hand-tuned the Asli Arts 35-inch Woven Hat Wind Chime offered by Windchime is made of 100 percent bamboo. Amazon presents a combination of East meets West. This 28-metal tube wind chimes that are tuned to the first notes of the hymn Amazing Grace. The wind chime also features 16 copper bells. The temple-style bells are embossed with dragons, suspended with beads and pendants decorated with the Chinese characters for peace, health, happiness, and safety. The total length of the wind chime is 30" and is 6.1" in width. Gaia Chimes offers several of the Koschi wind chimes. There are four elements, water, air, fire and earth assigned to the chimes. Each one is advertised as a musical instrument with eight chords. These are welded into the base of the bamboo tube and tuned for crisp clear tones. Each chime is 6.5" L. by 2.5" in diameter. You can find unusual outdoor wind chimes to create that special and tranquil yard. The sound of the chime should be one that resonates with you and instantly evokes a sense of calmness from you. Rock Candles offers a selection of feng shui wind chimes for indoors and outdoors. Novica presents several unusual wind chime designs from around the world. Wayfair offers a large assortment of whimsical, artistic and themed wind chimes. WeatherShack has excellent wind chime tones. Each listing features a sound icon when clicked plays the wind chime sounds. 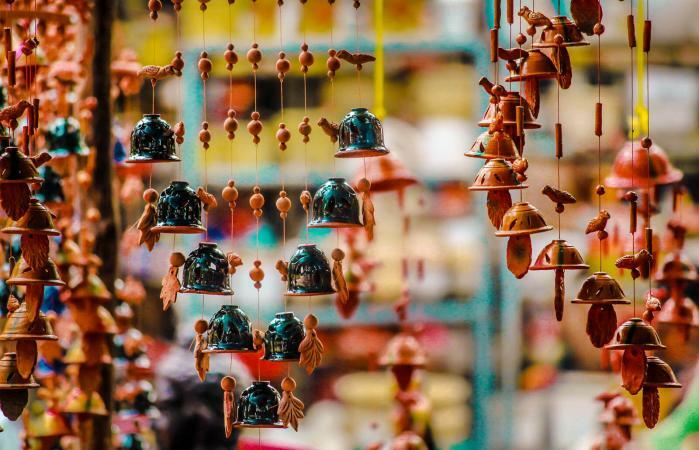 Whether you hang your unusual outdoor wind chimes in your garden, on your deck, porch, or patio, you will enjoy listening to the soft chiming sounds as they blow gently in the breeze. They will help quiet your mind as you listen to the melodic tones carried by the wind and watch the easy movement of the wind chimes, knowing they bring you good fortune and a better quality of life.